As used herein, any reference to "you", "customer", "visitor", or "user" refers to any person, entity, computer, or device which accesses the Website or places an order for any product or service from Lawngreetingcards. Any references to "we", "our", or "company" refers to Happy Home Solutions LLC, its agents, employees, subsidiaries, affiliates, and other related entities. BY ACCESSING THIS WEBSITE, YOU UNDERSTAND AND EXPRESSLY ACKNOWLEDGE AND AGREE TO BE LEGALLY BOUND BY THESE TERMS AND CONDITIONS AND OUR PRIVACY NOTICE, AND AGREE TO FOLLOW THESE TERMS AND CONDITIONS AND ALL APPLICABLE LAWS AND REGULATIONS GOVERNING THE WEBSITE. The Website is the sole and exclusive property of Happy Home Solutions LLC. "Lawngreetingcards", and any and all logos, trade dress, custom graphics, icons, and other service and/or trade marks (collectively, the "Trademarks") are the sole and exclusive property of Lawngreetingcards, and are protected by United States and international trademark laws. 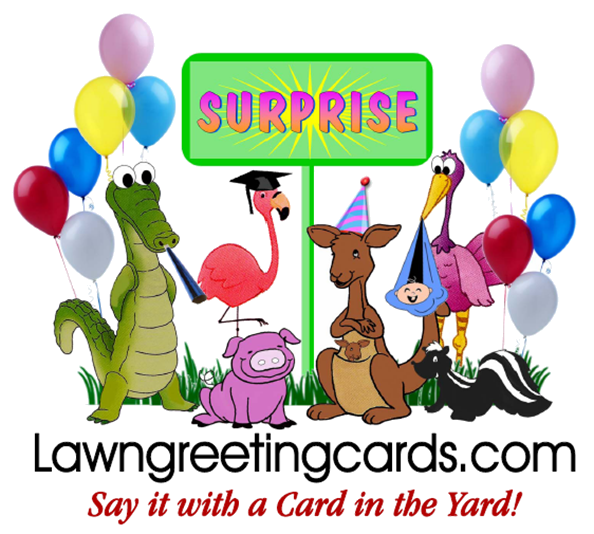 The use of any of the Trademark without the express written permission of Lawngreetingcards is strictly prohibited, and any unpermitted use may result in legal action on the part of Lawngreetingcards. Unless otherwise specified, all creative materials contained anywhere on the Website, including all text, designs, graphics, logos, icons, images, or any other material, including, without limitation, the selection and arrangement thereof, are the sole and exclusive property of Lawngreetingcards, and is protected by United States and international copyright laws. During the registration process you may be asked to select a unique password for access to certain portions of the Sites. You are responsible for maintaining the confidentiality of the password and account, and are fully responsible for all activities that occur under the password. By logging into the Website, you represent and warrant that: (i) you are the customer who registered for the services; (ii) that you are using the services only for permitted purposes; (iii) you are not a competitor of Lawngreetingcards, or agent thereof; (iv) you will immediately notify us of any unauthorized use of the password or account or any other breach of security; and (v) you will ensure that you exit from your account at the end of each session. Please notify us at 1-866-609-7773 of any potential unauthorized use(s) of your account, or breach of security. You also represent and warrant that: (i) you will not select or utilize a user name of another person with intent to impersonate that person; (ii) you will not select or utilize a user name in which another person has rights, if you do not have that person's authorization to use such name; and (iii) you will not select or utilize a user name that Lawngreetingcards in its sole discretion deems offensive. While we strive to maintain the accuracy and timeliness of all information included in the Website, we do not warrant and cannot guarantee the accuracy or completeness of any of the information, text, graphics, links, and other items herein. In the event a product is listed at an incorrect price or with incorrect information due to typographical error or error in pricing or product information received from our suppliers we shall have the right to refuse or cancel any orders placed for products listed at the incorrect price. Please note that the colors of items and products may depend on your monitor and may not be correctly displayed. The availability of products and other items on the Website may change at any time, without notice, and Lawngreetingcards reserves the right to cancel any orders placed for products which are no longer available. We shall have the right to refuse or cancel any orders as set forth herein whether or not the order has been confirmed and your credit card charged. If your credit card has already been charged for the purchase and your order is canceled, we shall immediately issue a credit to your credit card account in the amount of the charge. THE INFORMATION ON THE WEBSITE IS PROVIDED "AS IS" WITHOUT WARRANTY OF ANY KIND, EITHER EXPRESS OR IMPLIED. APPLICABLE LAW MAY NOT ALLOW THE EXCLUSION OF IMPLIED WARRANTIES, SO THE ABOVE EXCLUSION MAY NOT APPLY TO YOU. LAWNGREETINGCARDS FURTHER DISCLAIMS ANY REPRESENTATION ABOUT THE SUITABILITY OF THE INFORMATION CONTAINED ON THIS WEBSITE FOR ANY PURPOSE, INCLUDING, BUT NOT LIMITED TO, ANY REPRESENTATION OF FITNESS FOR A PARTICULAR PURPOSE. Lawngreetingcards makes no warranties or guarantees whatsoever that the Website shall experience 100% uptime or shall be at all times available for your access. Website downtime is most often caused by server/site upgrades or unexpected server crashes. Lawngreetingcards shall take reasonable efforts to announce any planned downtime on the homepage of the Website. However, unexpected server crashes are inevitable, and problems resulting thereof may persist for extended periods of time. If you experience a continuing problem with the Website, please contact us at 1-866-609-7773. LAWNGREETINCARDS WILL HAVE NO RESPONSIBILITY WHATSOEVER OR WILL BE LIABLE UNDER ANY CONTRACT, TORT, NEGLIGENCE, STRICT LIABILITY, OR OTHER CLAIM BASED ON ANY THEORY OF LIABILITY FOR ANY DIRECT, INDIRECT, INCIDENTAL, SPECIAL, CONSEQUENTIAL OR EXEMPLARY DAMAGES, INCLUDING BUT NOT LIMITED TO DAMAGES FOR LOSS OF PROFITS, GOODWILL, USE, DATA, OR OTHER INTANGIBLE LOSSES (EVEN IF ADVISED OF THE POSSIBILITY OF SUCH DAMAGES) RESULTING FROM THE USE OF OR THE INABILITY TO USE THE WEBSITE, SITE CONTENT, OR ANY PRODUCTS OR SERVICES, OR ANY FAILURE OF PERFORMANCE, ERROR, OMISSION, INTERRUPTION, EFFECT, DELAY IN OPERATION OR TRANSMISSION, COMPUTER VIRUS, LINE SYSTEM FAILURE, LOSS OF DATA, OR LOSS OF USE RELATED TO THIS WEBSITE OR ANY WEBSITE OPERATED BY A THIRD PARTY. APPLICABLE LAW MAY NOT ALLOW THE LIMITATION OR EXCLUSION OF LIABILITY FOR INCIDENTAL OR CONSEQUENTIAL DAMAGES, SO THE ABOVE LIMITATION OR EXCLUSION MAY NOT APPLY TO YOU. Lawngreetingcards accepts orders and processes payments for accepted orders at the time you place the order. We reserve the right, at any time after acceptance of your order, to accept or decline your order for any reason, including, but not limited to, any suspected illegal or tortious conduct. In the case of any cancellation, we will promptly refund any and all payments received by you for the order in accordance with our Cancellation, Returns and Refunds policy (below). We may require additional verifications or information before continuing any order. At the time an order is placed, you and Lawngreetingcards shall agree on each of: (i) the date and time of delivery of the product or service, (ii) the number of products to be installed, if any, and (iii) the date and time for the removal of any products by Lawngreetingcards, if any. We shall automatically charge and withhold applicable sales taxes for orders of products to be delivered to addresses within Illinois, and any other state which may require the collection of such sales tax from us. Each customer shall be solely responsible for all sales taxes, or other taxes, on orders shipped to any other state. Once payment is made there are NO REFUNDS except as follows: You may cancel any order at any time before you have been charged or payment processed. At any time following payment processing there will be a $25 processing fee plus 50% nonrefundable fee of your entire sign order. Any cancellation within 72 hours of the delivery time, there will be NO REFUND for the delivery of the goods by Lawngreetingcards. Your payment reserves your display to be available for the date you desired and prohibits us from re-selling that display for that day and time. But before the agreed upon time of removal of any products, you may request the earlier removal of the products. To the extent reasonably possible, Lawngreetingcards shall comply with a request for early removal of its products, but, however, shall reserve the right to charge a reasonable early removal fee. Lawngreetingcards provides a limited and selective directory of lawn decorations on the Website through which consumers can choose and order. Lawngreetingcards may, at any time, and without prior notice to you, remove any directory listing for any reason whatsoever. There are NO REFUNDS for any listing fees submitted to Lawngreetingcards for listing on the Directory. Lawngreetingcards does not endorse the services of any company listed on our Directory, and cannot guarantee, represent, or warrant any services or products which may be offered by thereof. Lawngreetingcards cannot guarantee, represent, or warrant the accuracy of any information contained in any Listing on the Directory. By using the Directory, you agree and understand that you may not make any claim against us for any damages or losses resulting from your use of the Website to obtain Directory listings. However, if you have a problem with any Directory Listing, please notify us at 1-866-609-7773. The Website may link to other sites operated by third parties. We have no control over other sites or their content and cannot guarantee, represent or warrant that the content of these sites is accurate, legal and/or inoffensive. We do not endorse the content of other sites, and cannot warrant that these sites do not contain viruses or other features that may adversely affect your computer. By using the Website to search for or link to another third party site, you agree and understand that you may not make any claim against us for any damages or losses resulting from your use of the Website to obtain search results and/or to link to a third party site. However, if you have a problem with a link from the Website, please notify us at 1-866-609-7773. The Website may contain advertisements and/or sponsorships. The advertisers and/or sponsors that provide these advertisements and sponsorships are solely responsible for insuring that the materials submitted for inclusion on the Website are accurate and comply with all applicable laws. We are not responsible for the acts or omissions of any advertiser or sponsor. Except as specifically authorized and permitted by Lawngreetingcards, you shall upload, post, host, push, or otherwise transfer by any means any content or materials whatsoever to the Website. 5. A statement by you that the information in the notification is accurate and that you have the authority to enforce the copyrights that are claimed to be infringed. By using the Website, you agree to indemnify, defend, and hold harmless Lawngreetingcards, its subsidiaries, affiliates, officers, agents and other partners and employees, from any loss, liability, claim, demand, costs and/or expenses, including, without limitation reasonable legal fees and expenses, made by any third party alleging, arising, related to, due to or resulting from your use of the Website, including providing a link to another site.